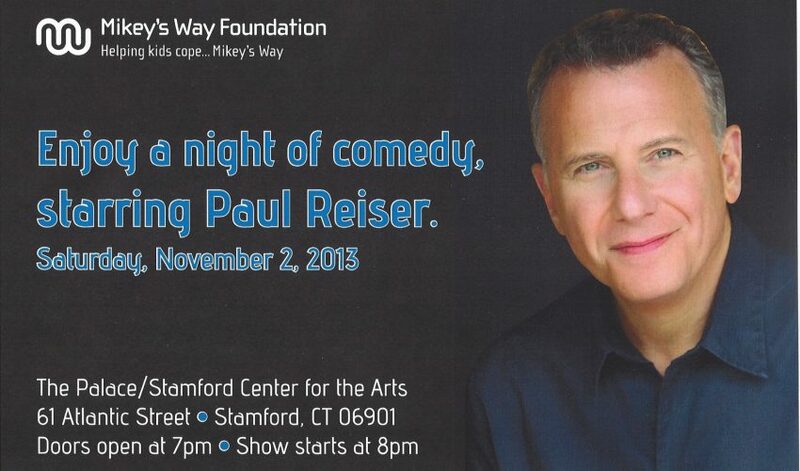 Actor Paul Reiser will headline the third annualComedy Night Fundraiser, a benefit for Mikey’s Way Foundation, on Saturday, Nov. 2, 7 p.m. at Stamford’s Palace Theatre. For tickets, which cost $50, $60 and $75, visitMikey’s WayorStamford Center for the Arts. New York comedian Chris Monty will open the show, which will be hosted by TV personality, best selling author and lifestyle expert Mar Jennings. There will be a “Meet & Greet" shortly after the conclusion of the event. Based in Fairfield,Mikey’s Way Foundationhelps “connect and enrich the lives of children suffering with cancer, and other life threatening illnesses," according to the organization’s website. Reiser is best known for his part in the 1990s TV sitcom “Mad About You." The role earned him nominations for an Emmy, a Golden Globe, an American Comedy Award and a Screen Actors Guild Award.